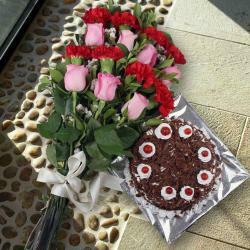 Product Consists: Heart Shaped Arrangement of 25 Red Roses in a Basket and Teddy Bear (Size : 6 inches) along with 1.5 kg Heart Shape Black Forest Cake. 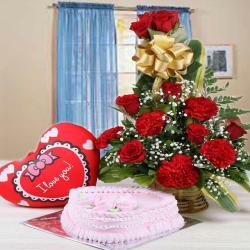 Give surprise on special occasion like Birthday, Anniversary, Wedding, Mothers Day and many more. This is a classy hamper that are adorned for precious gift a better grip and attractive packaging. This splendid gift of add extra exotic effect. This is a glorious arrangement so paired with these blooms to make it a super special hampers. 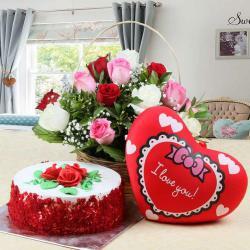 So go on and book your order now to send love to dear ones. Also send this hamper for your loved ones along with other bewildering Gifts to India through Giftacrossindia.com and make your dear ones feel special. 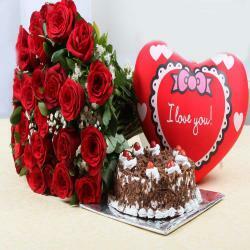 Product Consists: Heart Shaped Arrangement of 25 Red Roses in a Basket and Teddy Bear (Size : 6 inches) along with 1.5 kg Heart Shape Black Forest Cake.